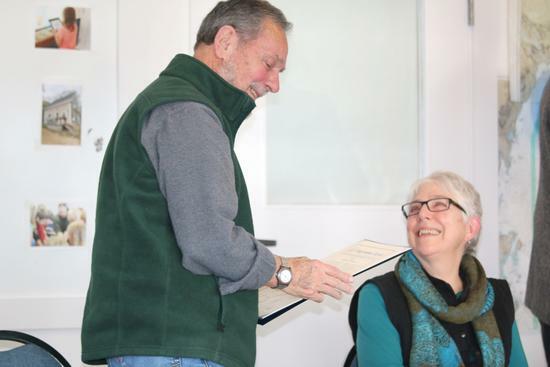 Ted Ames was honored for 60 years of contributions to Maine fishing and fisheries on January 27 at the Maine Center for Coastal Fisheries, which he co-founded with his wife Robin Alden in 2003. Senator Angus King has introduced a resolution into the Congressional Record in recognition of Ames’ many accomplishments. Ted Ames holds a copy of the resolution made by Senator Angus King for the Congressional Record at a January 28 luncheon in his honor at Maine Center for Coastal Fisheries, which he founded with wife Robin Alden, looking on, in 2003. 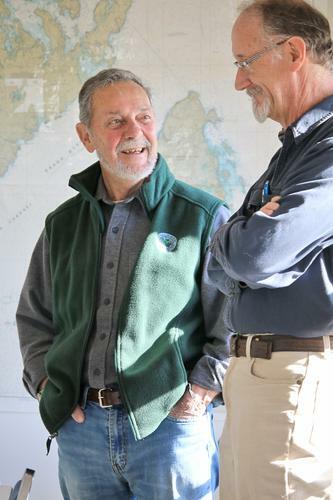 Ted Ames, at left, speaks with Fisheries Education Specialist Tom Dyum at a January 28 luncheon at Maine Center for Coastal Fisheries honoring Ames for his contributions to fishing, fisheries, and ocean ecology. 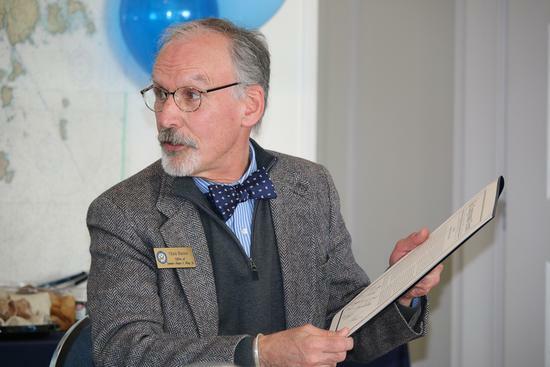 Senator Angus King’s regional representative Chris Rector, above, presents a resolution introduced into the Congressional Record recognizing Ted Ames for his accomplishments, at a January 28 luncheon at the Maine Center for Coastal Fisheries.